Jordi Quera is first a Catalan, born in Barcelona he is 48 and lives between the city and a house in the Pyrenees (Peramola-Alt Urgell). He is the father of two girls and a boy. He is the current President of Mountain Wilderness International since 2010, a Member of the board since 2003 which he was General Secretary between 2003 and 2005. He was President of Mountain Wilderness Catalunya between 2005 and 2011 and is an International Guarantor since 2008. Jordi graduated in Humanities and has also degrees in Social Education and Graphic Arts. On the professional side, he manages companies in the graphic and publishing sector. He also chairs Graphispack, an association dedicated to graphic and packaging industries for Iberian markets. Jordi is an all around alpinist, climber, speleologist, skier, hiker… Has an international experience gained from his travels, with friends, to many places around the world, often pushed by his personal discovery needs he climbed up a large range of mountains in the Himalayas, Pamir, Andes (Ecuador, Peru, Bolivia..), Kilimanjaro, Elbrus (Caucasus), Taurus, Atlas, Alps, Pyrenees…). He has a strong connection with the catalonian mountain huts, he is a member of the «Centre Excursionista de Catalunya», the oldest catalan Alpine Club, and other alpine clubs like the «Centre Excursionista d’Esplugues» and the «Club Excursionista de Gràcia», has been president of the GEDE (a climbing team) and is a founder of the AEPR (young group of Scouts involved in mountain activities). 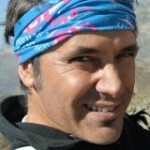 Jordi is a climbing, speleo and ski touring instructor.